For both ET and ES, aliases are resolved before the relevant underlying command is executed. CLIPTOCOL and CLIPTOCOLPLUS rely on one or more full path filespecs being present on the clipboard. 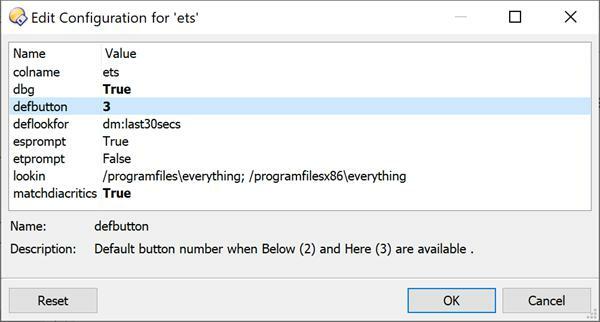 everything.exe and es.exe need to be present in your system and locatable. Go to David Carpenter's website to download the latest code. The lookin option can be used to point to where they are if they are not in one of the default locations. If you add a custom location containing spaces, e.g. E:\Program Files\Everything, do not use quotes. 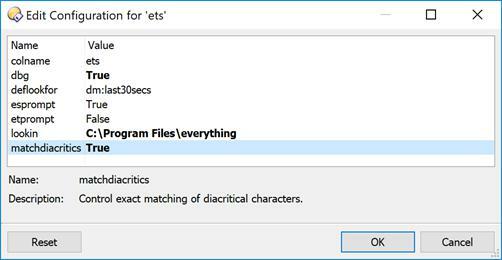 Executing ET or ES with no arguments always forces a prompt. Otherwise, by default, ES commands prompt the user before being executed and ET commands do not. The etprompt and esprompt options can be used to control this and pressing any qualifier key at run time will reverse whatever behaviour is in force. 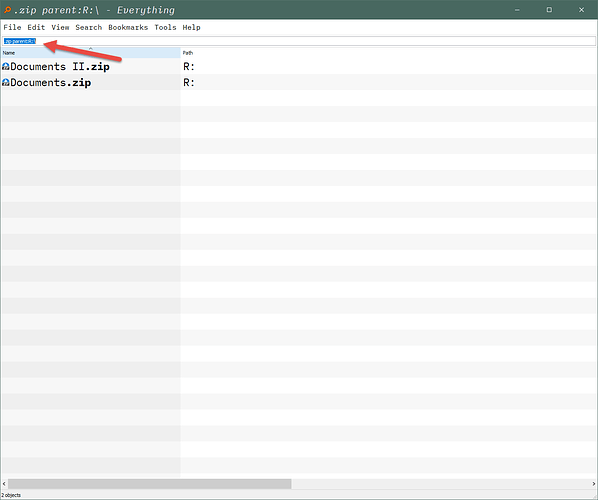 Below means restrict the search to the current folder and any subfolders. 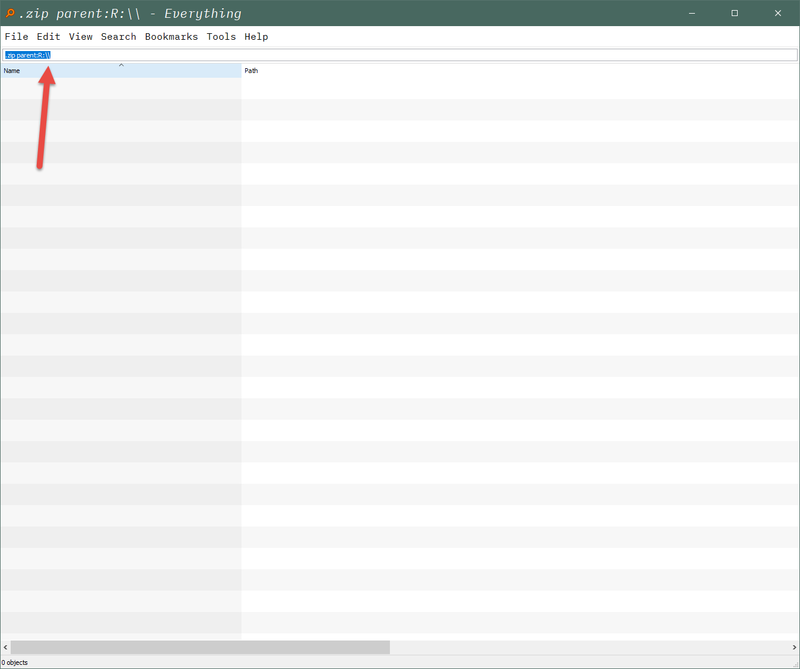 Here means restrict the search to the current folder. 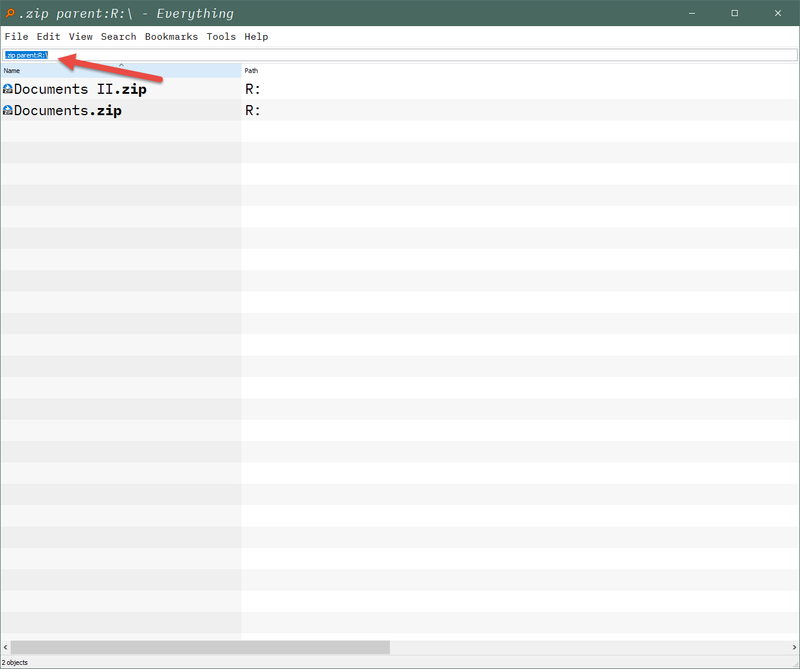 Drag the attached dcf file to a toolbar while in Customize mode. Updated to v2.1 to address ES handling of non-ASCII file names. 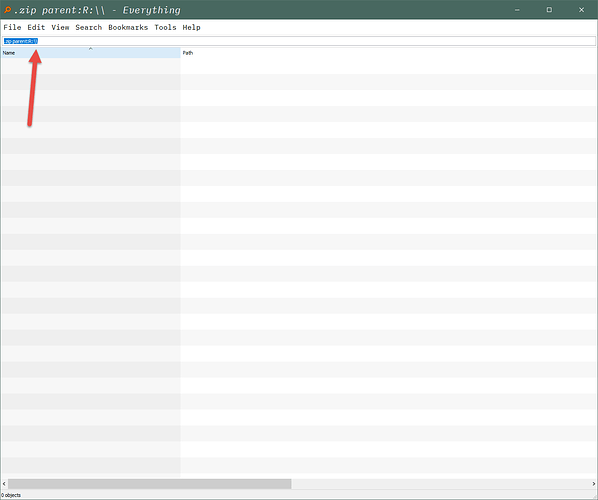 I can't get lookin to accept E:\Program Files\Everything. I've tried quotes, with and without trailing backslash. 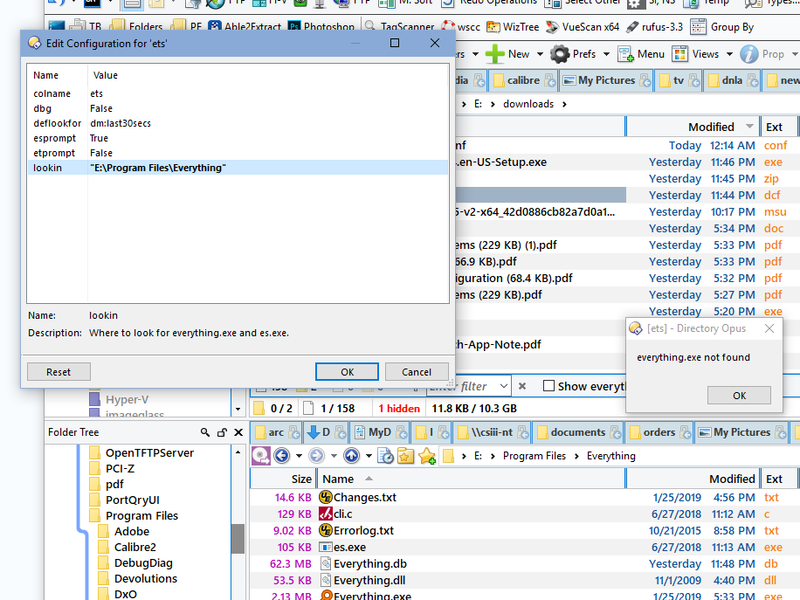 I can't get lookin to accept E:\Program Files\Everything. Can you please be a bit more specific. Are you saying you can't add the path to the lookin option or some other problem? It works here. The quotes should not be there, based on Aussieboyke's example above. As stated above, I tried it both ways. In the example he doesn't have quotes because he's using the alias /programfiles. That gave me the idea to create an alias called epf referencing e:\program files. /epf\everything works. After correspondence with the developer on the Everything forum, I have been able to revert to my original preferred approach of importing to a collection directly from an intermediate file generated by ES. I have updated the head post with version 2.0a. This version also adds a matchdiacritics configuration option. If this option is set to false (the default) then searching for wfn:prüfung.txt will find both prüfung.txt and prufung.txt. Setting it to true will eliminate the latter match. I followed the instructions to install this scipt. I have a problem... because a double " \ \ " appears automatically which prevents it from working, but if I manually delete a " \ " the search gives the right result. Do you have any idea how to remove that extra " \ " in the code that is automatically put in? Thanks for reporting that bug Steph. I have fixed it and updated the head post with version 2.3 which also adds ESPLUS and CLIPTOCOLPLUS commands. As their names suggest, these commands add matching items to the target collection. The sample menu of buttons has also been updated to include the new commands. Thank you for your answer AND fix the problem so quickly! I have one more question. Is it possible to choose which bouton is proposed by default? Let me explain, currently it is the "Anywhere" button that is activated if you just "enter". Would it be possible to set the "Here" button to enabled by default. Since I launch my order from Opus and know what directory I am in, it makes more sense (in my opinion) to be able to just "enter" to launch the "here" command, so with the "Here" button preactivated. Is it possible to choose which bouton is proposed by default? It should be doable. I'll have a look and post back later. I have updated the head post with version 2.4 which includes a configuration option to choose which button is the default. The normal default is 1 (Anywhere). Change the value of defbutton to 3 if you want Here to be the default.